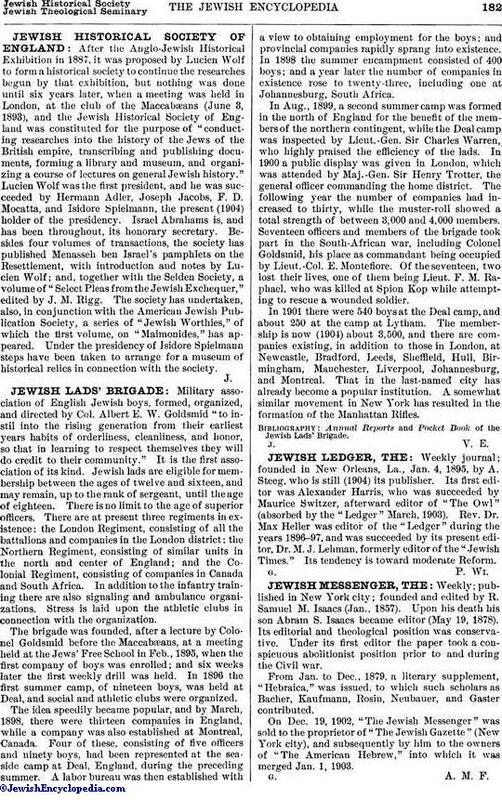 After the Anglo-Jewish Historical Exhibition in 1887, it was proposed by Lucien Wolf to form a historical society to continue the researches begun by that exhibition, but nothing was done until six years later, when a meeting was held in London, at the club of the Maccabæans (June 3, 1893), and the Jewish Historical Society of England was constituted for the purpose of "conducting researches into the history of the Jews of the British empire, transcribing and publishing documents, forming a library and museum, and organizing a course of lectures on general Jewish history." Lucien Wolf was the first president, and he was succeeded by Hermann Adler, Joseph Jacobs, F. D. Mocatta, and Isidore Spielmann, the present (1904) holder of the presidency. Israel Abrahams is, and has been throughout, its honorary secretary. Besides four volumes of transactions, the society has published Menasseh ben Israel's pamphlets on the Resettlement, with introduction and notes by Lucien Wolf; and, together with the Selden Society, a volume of "Select Pleas from the Jewish Exchequer," edited by J. M. Rigg. The society has undertaken, also, in conjunction with the American Jewish Publication Society, a series of "Jewish Worthies," of which the first volume, on "Maimonides," has appeared. Under the presidency of Isidore Spielmann steps have been taken to arrange for a museum of historical relics in connection with the society.